Meals On Wheels :: Caddo Council on Aging :: Shreveport, LA. Meals On Wheels is a service designed to help seniors maintain their independence as they face financial, physical, or emotional hardships. 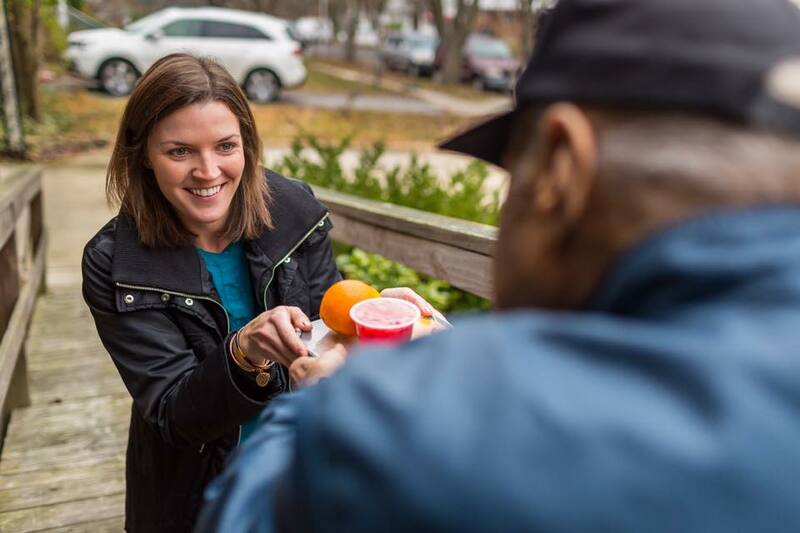 A hot meal designed to meet one-third of the daily requirements for senior nutrition is delivered to the homes of seniors who, due to frail health, are unable to shop and/or cook for themselves. In addition to the nutritional benefit, this program provides a yearly wellness check for seniors. Meals on Wheels is a service designed to help seniors maintain their independence as they face financial, physical, or emotional hardships. Hot meals delivered to the door by friendly staff members may be just enough support to enable someone to continue to live a productive life in the community. Nutritious low fat meals with no added salt are delivered around lunchtime. All meals provide 1/3 the daily nutritional requirements as determined by the USDA. Please click on one of the below listed months to view the current menu. Note: Not all months are available at one time, generally just three months at a time during the year. Seniors 60 years or older who are homebound, living alone and have physical disabilities that prevent them from preparing an adequate nutritional meal and do not have the support of family and friends on a regular basis. People pay what they can. The suggested donation for Meals on Wheels is $5.00 per week. No one is denied a meal because they do not make a donation. Is there a waiting list for this program? Yes, there is usually a very long waiting list for this program. Your organization can volunteer to deliver meals. It's easy. We bring the meals to your "station" Monday - Thursday before noon; then you and your members deliver them to eight seniors who live nearby. It should take less than 40 minutes. We told you it was easy. It's also rewarding! We're Ready when you are! For more information, pickup the phone and call Monica Wright at (318) 676-7900 or CLICK HERE. Dinners which are delivered to your home by staff drivers should be eaten as soon as you receive them. Because of our concern for safety, volunteers are asked not to leave a meal when no one is home. Meals cannot be left on the porch. Meals on Wheels is not an emergency service. Sometimes cancellations of delivery are necessary due to bad weather. Please keep extra food in your house in case this happens, especially in the winter months. The Meals On Wheels program depends on you to let us know about changes in your condition that might alter your eligibility for Meals on Wheels. If at any time you do not need Meals on Wheels, please let us know. The Council On Aging, Inc. sponsors community meals all over Caddo Parish. We hope your health improves to the point that you are able to get out and join us at one of the many congregate meal sites throughout our coverage area. Transportation is often available. A final note about forms and information. To continue programs like Meals On Wheels, The Council On Aging, Inc. must comply with state and federal requirements for information. This means a visit from a representative of the Council On Aging will call you or ask to visit you to fill out a registration form. Your help and cooperation will help us to serve you better. Thank you. There is such a need in the community for this service. The Caddo Council on Aging is a 501(3) c organization and all donations are tax deductible.